Urethane Products Corporation is on the leading edge of fendering technology and innovation. Our lines of Marine GuardTM and Marine CushionTM foam-filled fenders utilize state-of-the-art materials and processes, which are unsurpassed in the industry. Foam-filled fenders are able to absorb 40% more energy than similar sized pneumatic fenders and their gently sloping reaction force curve provides 'softer' docking operations compared to buckling type fendering systems. This results in reduced stresses on docks, wharves, piers and vessels. 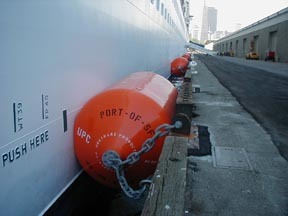 Today's vessels demand the absolute best protection for berthing operations. It is Urethane Products Corporation that is entrusted more and more each day to guard marine investments worldwide with our 'made-to-fit' foam-filled fendering systems. DOWNLOAD MARINE GUARD FLYER HERE! 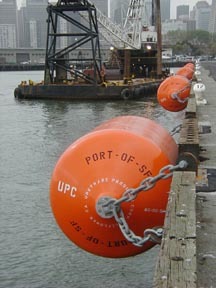 Marine Fenders in San Francisco.